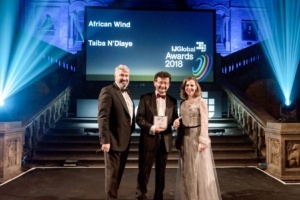 On 21st March 2019, Lekela attended the IJGlobal Europe & Africa Awards at the Natural History Museum in London, where our wind farm in Taiba N’Diaye, Senegal, West Africa’s first utility-scale wind power project, won the award for African Wind Deal of the Year. The event celebrated deals closed and participants involved in infrastructure finance over the course of 2018. This was the third IJGlobal awards night to have been staged during the month, following events in New York and Dubai to celebrate successes of the 2018 calendar year in the Americas, the Middle East and North Africa, respectively. The awards were decided by aggregating scores from across all four regional judging panels and cross-referencing those findings with IJGlobal’s 2018 league tables. PETN is a critical component of the Government of Senegal’s Plan Senegal Emergent. The wind farm is currently under construction, and once complete it will provide up to 158.7MW of much needed clean, reliable and competitively-priced energy into the rapidly expanding national grid. It will also save over 300,000 tonnes of CO2 emission into the atmosphere per year. As well as creating up to 400 employment opportunities during construction, PETN is deploying a broader socio-economic programme in the Taiba N’Diaye area creating sustainable livelihoods in the local community. Projects to improve local agriculture, provide vocational training opportunities, and refurbish and build local infrastructure is the start of this 20-year programme that will invest up to $20 million over the life time of the wind farm. Already, a new marketplace has been constructed for Taiba N’Diaye’s farming community, while a new IT centre is being built for local schoolchildren. The 46-turbine wind farm using Vestas turbines is scheduled to be fully operational in less than two years’ time. It will provide over 450,000 MWh of energy per year for over 2 million people, representing an approximate 15% increase in generation capacity for Senegal.